As "Schmuck-Egg-In-The-Face Bettman" addressed the league’s board of governors in New York last week, Gary Bettman admitted he had no clue that two of his closest NHL confidants – L.A.’s Philip Anschutz (responsible for last year's England opener debacle) and Minnesota’s Craig Leipold – had lent San Jose banker Boots Del Biaggio (alleged deadbeat and bankrupt NHL owner) a combined $17 million (U.S.) to help him pay for a $25 million stake in the Nashville Predators. 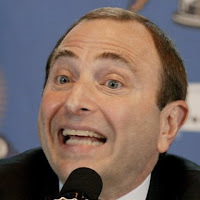 NHL owners were speechless, according to a source who attended the meeting, as Bettman grumbled he had been in the dark. Neither Anschutz nor Leipold had made him aware of the cozy back-door deal. In corporate North America, Bettman would be forced to find his 'exit strategy' with such blunders - honorable discharge - and he was obviously absent from his weekly NHL hourly broadcast as he had to attempt to keep his position as Mr. Know-It-All-of-the-NHL. In other news, the NHL trade happened over the weekend. We acquired yet another no-name to send to Hartford -- funny that many of the current bloggers posted with "Who Cares? "(see jibblescribbits) or "It goes to show you it doesn't mean anything".....I just find the entire event premature and a little boring. "A heads up. Sundin's has always wanted to play for the NY Rangers, and is talking to NY Ranger management today (who wouldn't after last night!) -- discussions of trading Straka and Callahan and a first and second round pick - for a potential answer to our offensive challenges. Don Meehan, agent for Sundin approached the Rangers. He has told Sather he wants to play next to Jagr and Drury. Hate to ruin your day, but these talks are happening..... 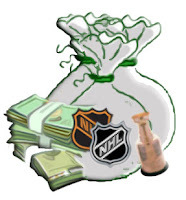 I am putting it on the blog later this afternoon when my source gets me confirmation of talks, launching The Dark Ranger site before Spector or HockeyBuzz knows anything about it." I won't even post his offensive and "hockey-racist" response. As any Toronto Maple Leaf fan would do, it was filled with stereotypical cliche's about how great their losing team is --- and plenty of swearing. Regardless, it is fun to look back and verify that the people, we, hockey bloggers know within the depths of hockey organizations sometimes actually know 'inside' dirt. You will hear it here if there is anything to discuss that the mainstream columnists and bloggers aren't already talking about. Next Tuesday is free agency day -- and perhaps we will see some important re-signings (Avery, "some would say Jagr") and some new acquisitions on the team; the likes of Brian Campbell, Mats Sundin, Brian Gionta, Ryan Malone and other potential dreamy free agents becoming Blueshirts would be a pleasant and unexpected surprise. 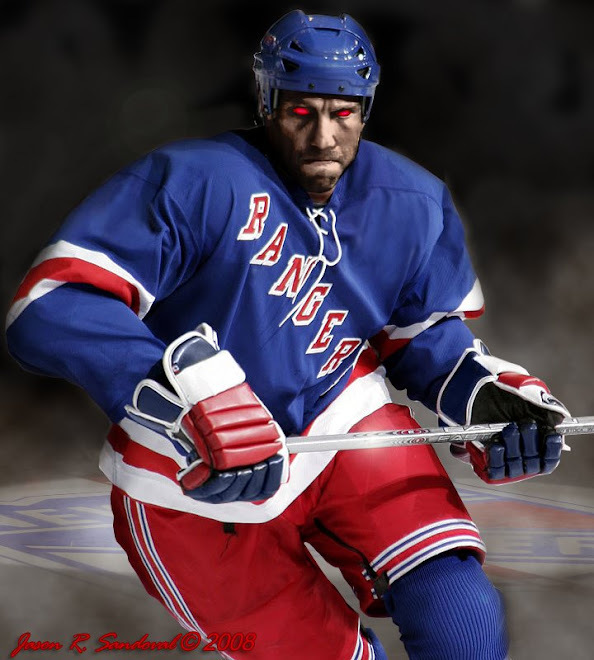 As we saw the Rangers acquiring two of the three most-sought-after free agents last summer (Drury & Gomez) it is entirely possible that Slats and the Blueshirt management are smarter than we think they are. Thanks for linking to my site! You've got a great site yourself. I'll put a link to your site on mine. i like your stuff 5-hole. Keep it up...Tuesday is going to be fun. What Will Our Team Look Like? The Dark Ranger Is Not Alone! Bettman the Barbarian Takes On Dolans!